"I stand for nationhood, a vote tomorrow for Miles Richardson will ensure the path to nationhood is strong." AFN NC candidate Katherine Whitecloud is about to speak now. "It seems like we have been racing, it seems like we have been rushing," said Whitecloud. "There are many people here, especially those that are sitting a mile back from here...who have not had the opportunity to express their voices," said Whitecloud. "It's not about today, and it's not about winning tomorrow. It is about the life of our children and the life of our grandchildren," said Whitecloud. Should have mentioned who I'm talking about, lol. Miles Richardson! AFN NC candidate Miles Richardson to speak now. "I heard a lot of talk about money, but it’s never going to close the gap," said Whitecloud. "No one has jurisdiction over my children and my grandchildren and my family except me and my brother and my sister, and that is how nationhood begins," said Whitecloud. Incumbent AFN NC Perry Bellegarde now about to speak. Bellegarde said one of his traditional names is "Thunderbird Child." "We did not cede or surrender or relinquish title to the Crown. The principle was peaceful coexistence and mutual respect between our people. But that’s not what we see today," said Bellegarde. Bellegarde getting a lot of applause and hoots from the room as he says First Nations people never got anything for free, because they shared the land and resources of this country. "That languages Act is so fundamental to our identify , working toward fluency, so more of our languages will no longer hide in the shadows of English and French," said Bellegarde. Bellegarde said the justice system in Canada needs a complete overhaul and needs to add "First Nation laws, Creators law, and natural law alongside common law." Bellegarde said if elected he will call a special chiefs assembly to modernize the AFN and update its governing charter. "So chiefs, I ask for your support to continue the momentum we started four years ago, vote for me tomorrow," said Bellegarde. AFN candidate Sheila North about to speak. Singing and drumming opens her moment. "It’s time. It’s time for our laws and our sovereignty to be revitalized. Our First Nations have a lot at stake," said North. 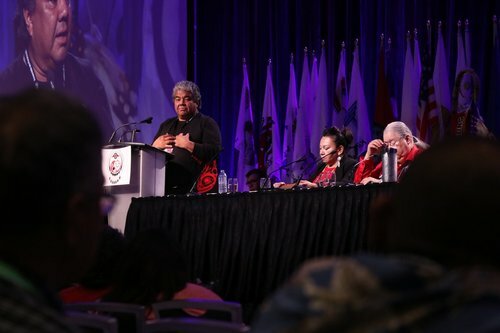 "I have heard in my travels that many of you are dissatisfied with the AFN," said North. North is now naming each province and highlighting their specific issues. "You don’t need an organization making deals with the government," said North. "We need a national chief who can sit at the table with the Liberals without becoming one," said North. As of right now, 522 chiefs and proxies have registered to vote tomorrow for national chief. Obtained some #s of regional breakdowns of chiefs and proxies voting tomorrow. Out of 522, 155 are from B.C. The next largest block is from Ontario with 120. BC could decide the election.